One hundred pigeons are missing from Washington Square Park. Should we care? You can look at pigeons one of two ways: as pooping, disease-ridden pests, or ambassadors of nature in an otherwise urban setting. Last week's news that 100 pigeons went missing from Washington Square Park — after perhaps being lured and netted by hunters — has polarized New Yorkers. Some were happy to say "good-bye to a huge flock of 'rats,'" as one commenter on our story wrote. Others, like animal activist Tina Trachtenberg, worried about the welfare of "these innocent, trusting, loving pigeons." In an attempt to weigh the arguments of both sides, we've listed the pros and cons of pigeons, otherwise known as rock doves, below. ► With so much food to be scavenged from garbage cans and sidewalks, and with humans feeding them, pigeons in the city can spend less time searching for sustenance and more time mating. That leads to overpopulation — and lots of pigeon droppings. 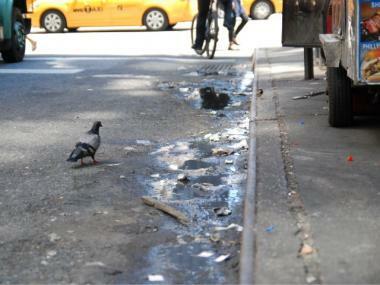 ► Speaking of pigeon excrement, a single pigeon excretes 25 pounds of droppings a year. Those droppings deface buildings, quicken the pace of their deterioration and add to their costs of maintenance. ► Let's not forget that pigeons served this country in both World Wars as stealthy message carriers. ► Pigeons do more than eat and poop: they can compete in races. During a competitive pigeon race, competitors are released simultaneously from one location and the pigeon that makes it home to its own coop first wins. ► Some people find them aesthetically pleasing. Photographer Andrew Garn, who snapped pictures of 5,000 pigeons over the course of four years, told New York magazine he finds them "really quite beautiful" up close. And we have to admit, the iridescent green and purple neck of a pigeon can be quite beguiling — when the bird isn't pooping on us.